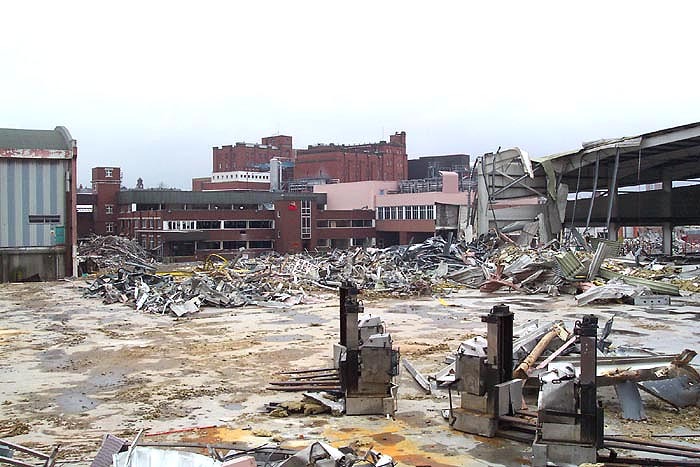 Sadly, this page not only displays the demise of the Mitchells and Butlers brewery railway at Cape Hill and the Harborne Railway to which it was connected, but also the demise of the brewery itself which is in the process of demolition as of March 2005. 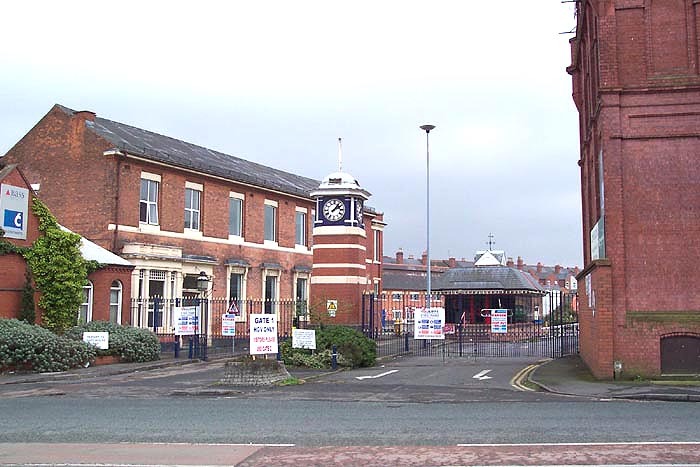 The brewery itself was opened in 1881 with rail connection coming some 26 years later in 1907 via a 1000 yard-long spur from the privately owned and LNWR ran Harborne Railway; coming off the line approaching Rotten Park Road station from the direction of Harborne. The line, upon leaving the Harborne Railway, passed under City Road (the bridge can still be found today) then curved right and splitting into two with one line crossing what was then a canal feeder and entering the works 100 yards or so from Shenstone Road and the other crossing the canal feeder and entering the works beyond the end of Oliver Road. The standard gauge railway was operated by M&B-owned steam locomotives, two of which were 'second-hand' industrial tank engines (Beatrice and Boniface) and two which were built for M&B: John Barleycorn, seen above emerging from the brewery loco shed in 1947 (photo: Douglas Clayton), and John Barleycorn II. 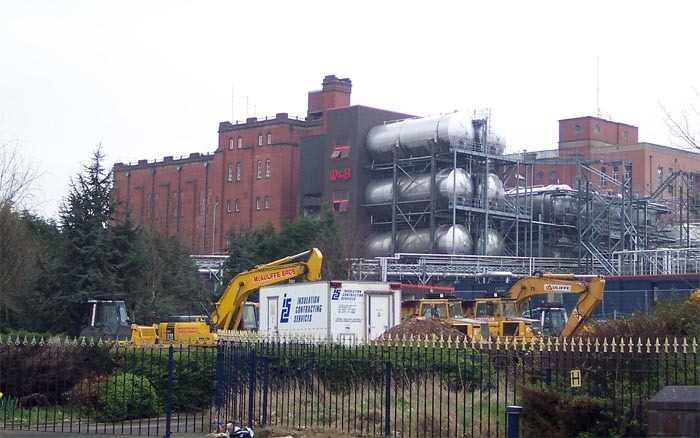 Above-left we see the 'front-face' of the brewery, looking up Cape Hill: a familiar and well known landmark in Smethwick (although sadly, in this shot, missing its trademark tower which had been removed a few days before my visit). 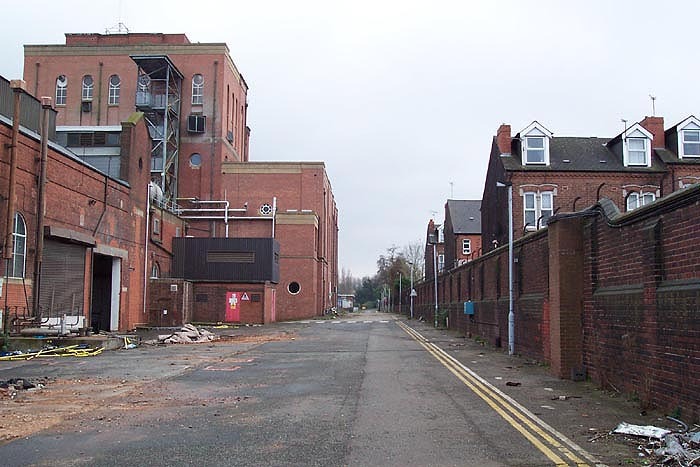 As was mentioned above, the brewery has recently closed and is in the process of being demolished with the site to be be utilised for a housing association development. Running along the top of the building seen here are the slogans	'Duty Paid Stores','Wine & Spirit Bonders', Mitchells & Butlers LTD' and 'Gold Medals - London & Paris'. Above-right we are looking at Gate 1 on Camp Hill, now plastered with signs pertaining to the demolition work in progress: note the building to the left dating from the construction of the brewery on this site. The railway here, which incidentally would not have been visible in either of these views, operated a system whereby goods were bought along the Harborne Railway as far as the goods sidings at Rotton Park Road station where they would be picked-up by the M&B locos and taken into the works: the finished produce being removed by the reverse of this process. M&B locos were not allowed to operate beyond the aforementioned sidings. Above-left and right we are looking from Gate 3 on Cape Hill to the site of a double-track siding and buffer stop with the end of some terraced houses visible to the right (The Hollies and The Laurels). Immediately beyond the main structure to the left is a turning and the buffer stops lay beyond that to the left of the roadway. 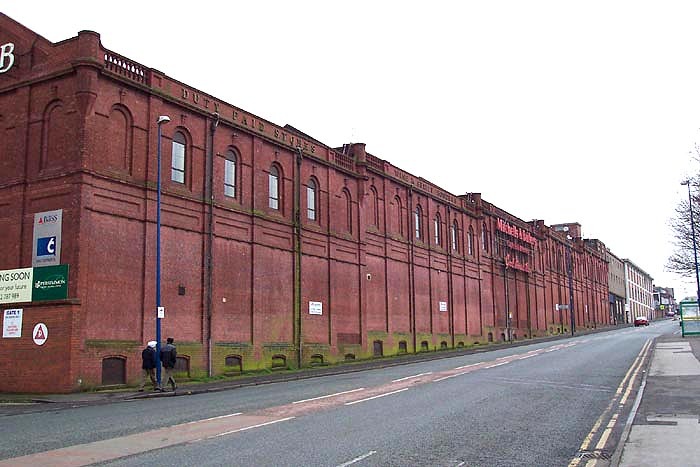 The other side of this building, to our left in this view, also fronted two sidings. The sidings mentioned here led from one of the feeds to the factory site whilst the main trackwork looped around the far-side of the factory from this view along the side of the site fronting Shenstone Road and Majuba Road. Above-left we see the demolition diggers poised for action with the 'business-end' of the brewery beyond them: the railway here would have run between the diggers in the foreground and the main building beyond - virtually encircling the latter. 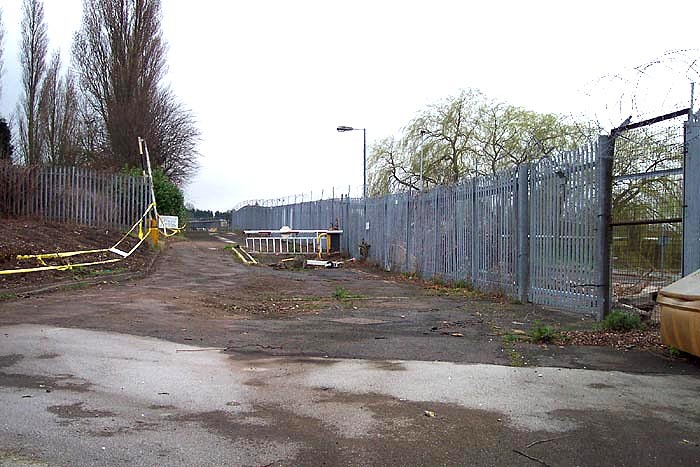 Above-right we are on Shenstone Lane looking through an unnumbered gate and towards the point that the second line entered the works: As opposed to the line that entered the works near Oliver Road on the other side of the brewery, the line here entered the site double-tracked. 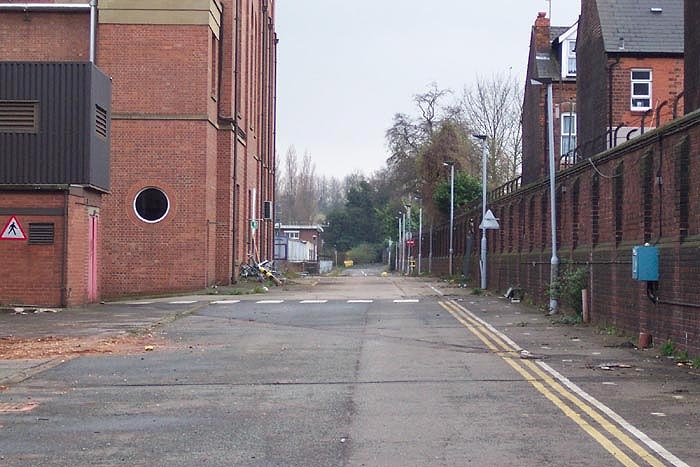 Above left we have the entrance seen previously to our left and are again on Shenstone Road. 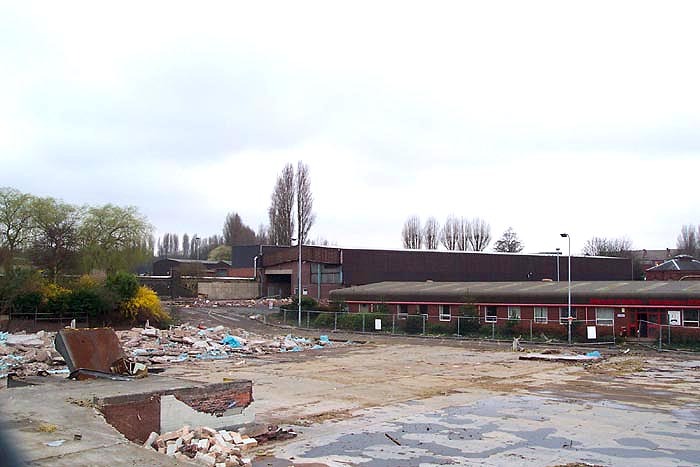 The demolition company have actually done us a 'favour' for this shot in removing the warehouse that would have stood between our position and the single-storey Distribution Centre seen ahead. The Distribution Centre was a fairly late addition to the site and stands on the spot once occuppied by four distribution sidings as the double track feed to the site was doubled just beyond the trees to the left upon crossing the canal feeder and entering the brewery site proper. Above-left we are still on Shenstone Road and dead-ahead to the left of the shot stood the engine shed (as seen to the extreme left of the 1947 shot at the top of this page which also shows the terraced houses on Shenstone Road in the background). The main line passed behind the shed in this view heading right and split into two branches: one going directly ahead and the other going to the right and between them almost encircling the main buidling blocks ahead. Although road traffic had begun to erode, and eventually would have overtaken, the use of the railway for brewery traffic, British Rail curtailed the gradual demise of the line by announcing the closure of the Harborne Railway being scheduled for 1963, a move that would have isolated the railway at Cape Hill, necessitating its closure which was achieved on 31/03/1962. 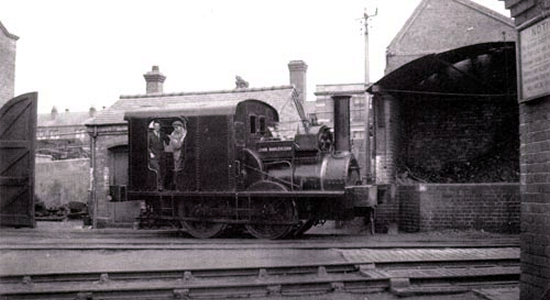 It is interesting, however, to note that the traffic for Cape Hill had, along with that for the Chad Valley works at Harborne, been largely instrumental in keeping the Harborne Railway afloat and preventing the line from premature closure in 1934 when the poor patronage of the line led to its withdrawal of passenger services. Although nothing appears to now remain of the railway I felt it important to document the site before it is totally cleared away and am glad I got the opportunity to visit when I did: another example of the death knell being rung for industry in the region!